Sunsets are a must-see from the large wrapping balcony of this cozy beach apartment in Las Catalinas, but you could just as well spend your entire day there, basking in the sun and taking in the sights and sounds before you. 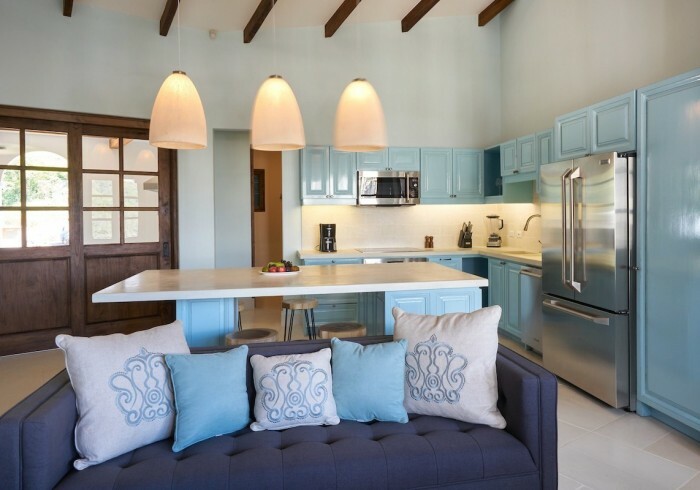 Refreshing mint and white hues await inside, so that you relax and freshen up as soon as you come back to the interior of this delightful Guanacaste penthouse with full ocean views. The ability to connect or section off its various spaces make this flat particularly adaptable. If the living room is pure coolness with its colors and simple décor, the roofed, open back terrace gives a warmer feel, with the tropical dry-forest right in front of you. The spot is equally suited to entertain guests, set up a spontaneous BBQ, or enjoy your favorite sport. Chic simplicity is a recurrent theme throughout these smart beach flat, including both of its two suites, each with an en-suite bathroom. The master features a comfortable king bed and a large spa-style bath, with a smaller, private terrace offering a more secluded viewing spot, while the other suite’s two single beds can easily be turned into a king. Minty-cool and surprisingly flexible, this elevated beach penthouse at the heart of Las Catalinas, Guanacaste offers some of the best sunset views in town. Up to four guests can be accommodated in this Carlota apartment, where children are welcome.